When do babies drop to one nap. How to drop the morning nap and what it looks like with a Babywise baby. How to make the transition to one nap smooth. Kaitlyn has dropped her morning nap! I really love it when the child goes down to one nap a day. I know it sounds crazy, but those who have experienced it might understand where I am coming from. It is easier to get out and do things. You have one long chunk of time in the afternoon. For me, both kids are pretty much on the same schedule. It is lovely. I wanted to share how we got here. I decided one day to take my own advice and start taking notes on her naps so I could visually analyze the situation. See Problem Solving Tip: Detailed Log and BW Tips and Tricks: Keep a Log. Here is what my log looked like and how I analyzed the situation. I woke her at 11:50 (I let her sleep longer since she took so long to fall asleep). MY THOUGHTS: I thought this was a great sign that perhaps she was ready to drop the nap. MY THOUGHTS: I was confused. This seemed very off for her. I assumed she would have one good nap a day, not two terrible naps. I did some investigating of her mouth and discovered two molars had started to break through. She was teething. This was bad news to me because I knew it would make determining if she was ready to go to one nap a day more difficult. MY THOUGHTS: This was a clockwork nap. Teething was definitely a disrupter the day before. MY THOUGHTS: This was sad for me. Another clockwork nap. This day made me think that perhaps she wasn’t ready to drop that morning nap after all. Kaitlyn got her 18 month shots this morning as well as her second half of her flu shot. I knew it was another disruptor to my factors. MY THOUGHTS: Another clockwork nap. Small noises at 3:10, then quiet. Unsure if she was awake or not. MY THOUGHTS: Another good napping day, but vaccinations can cause that for her. MY THOUGHTS: This was not a clockwork nap. It gave me hope. Made small noise around 3:00, but unsure if she woke up or was just transitioning. MY THOUGHTS: A good nap, especially for no painkiller. I stopped giving painkiller after this. MY THOUGHTS: Another good nap. Noise at 3:00–then quiet. Not sure if she was awake or transitioning. MY THOUGHTS: This nap seemed disrupted enough that perhaps she might be ready to drop the morning nap? I forgot to listen on the monitor until 3:45. She was talking at that time. MY THOUGHTS: Another disrupted afternoon nap, but she went down late so that could explain it. MY THOUGHTS: I was happy she could stay up until 1:00. That has been a road block to us dropping the morning nap. As you view this log, you can see that there were many hindrances to an overall evaluation. Teething and vaccinations added factors to consider. There really isn’t any consistency from day to day with the napping. In the end, I decided to just give it a try and see how it went. One reason for this is toward the end of the week, afternoon naps seemed disrupted while morning naps were great. Another reason was that she made it to 1:00 the day she skipped her morning nap for church. A final reason was that she was 19.5 months old and was in the age range for dropping the nap. I guess the ultimate reason was that I wanted it dropped and wanted to see if she could do it. I decided Monday was a great day to skip the nap and see what happened. It would be her second day skipping the nap. Worst case scenario would be that she wasn’t ready to drop it and I would add it back in on Tuesday. No problem. We dropped it and she did great. She has had it dropped for nearly two weeks now. Things have gone really well with it and I am glad I gave it a shot. I have just started doing BW. My son is 5 weeks old. He is doing pretty well with everything. I am still trying to figure everything out. I am having a problem with the morning wake time. He is put down at about 9 and then we do a DF at 10:30. Other than this feeding he is going about 2.5 hours in between feedings. He then sleeps for about four or five hours at night. So last night he woke up at 4. Then he woke up at 6:30 and ate but I don’t want that to be wake time, I would like it to be 7:30. He wouldn’t wake up after he ate at 6:30 either. What shoud I do? I hope I made sense. Sorry to bother you with yet another question but my baby girl has gotten herself to be pretty solid on a bedtime of 5:45 – 6 PM. In fact, if I wait until 6 she’s usually screaming bloody murder because she’s so tired. Anyway, she’s 11 weeks and is on the following eating schedule (goes down to nap about 50 – 60 mins after she wakes, CANNOT be awake longer than that) 6 am feed, 9 am feed, 12 pm feed, 2 30pm feed, 5 pm feed, (6 pm bedtime) 730pm dreamfeed, 1030pm dreamfeed. Until about 10 days ago I would wake her for her 7:30 PM feeding because her 10:30 was already a DF. She really hated being woken up so I just broke down and now I do two dream feeds, one at 730 and the other at 10:30. She usually makes it to about 5 AM and then starts babbling, but our doc said not to go in until 6 am. This works really well for us. My question is this: I know that the next feeding I’m supposed to drop is the 10:30 feeding. I recall the indicators of her being ready to drop that feed are STTN for 2-4 weeks and generally showing disinterest in that feeding. My daughter eats well and voraciously at the 10:30 feeding but has taken to barely eating anything at 7:30 and sometimes even spitting up-something she never does during a DF. My intuition is telling me that she doesn’t really need the 730 feeding, but I’m hesitant to drop the feeds out of order. I know you have many moms asking you questions, but if you recall the issues I’ve been having with her napping and nighttime sleep, I wasn’t planning on dropping the 1030 feed until the end of January because we’re going away for Christmas to a new time zone for 5 weeks and I wanted to wait until we were back home before transitioning her. Anyway, if this continues I feel like I might now have much choice as she’s obviously showing me that she’s not really interested in that feeding. What are your thoughts? As a side note, I wouldn’t mind dropping her 7:30 feeding because it would give me a lot more freedom in the evenings and I don’t really mind be back to feed her at 10:30. Yeah for Kaitlyn!! and for you. Scooter is 6 months dropping the 3rd nap which frees up my afternoon. Everyone says “oh just wait until hes only taking one nap-you’ll regret it.” But I enjoy spending time with him and really can’t wait.I’m struggling with the morning nap though. Scooter is cutting both of his bottom teeth together. His morning nap is about 60-65mins long. If I get him up, he is cranky and doesn’t stay up his usual time. If I leave him in bed he plays and rolls around for another 60mins. He never fusses about being in bed. But is then still cranky when I get him up.I’m not sure if its a teething problem or a sleep problem. I’ve tried trouble shooting everything. Did either Brayden or Kaitlyn have disturbed naps but not fussy naps? Maybe I should see how he does with a dose of tylenol before a morning nap? I know you are excited about getting the video monitor for baby #3!! It is well worth the money. We LOVE it. Congrats on one nap. Enjoy! Great news! I took your advice that you gave me this week and sure enough Isabella was ready to drop her am nap, however she can barely make it till 12 but she is taking a good long nap and is able to make it till 7 after she wakes. Now that she has a long afternoon I am trying to work on how to fill her afternoon, she is 16 months. Can you give me some ideas of what you are doing with your daughter now that she has a longer am and pm wake time? Normally we have a harsh winter, however this December has been rather warm. I have read your posts about dropping naps but have a few (maybe dumb) questions. My 9 1/2 month old is still taking the 3rd nap – depending on the previous 2 naps that day. We put her down for her 1st nap about 2 1/2 hours after she wakes. then she can usually last another 2 hours before going down again for her second nap. IF she takes two 1 1/2 to 2 hour naps she doesnt need the 3rd nap. however, she sometims takes 45-60 naps and then gets sleepy again an hour after waking. She is teething pretty badly right now so I know that can throw things off a bit, but I am at a loss at what to do here. Isn’t it normal for a baby her age to take at least 2 two hour naps? she sleeps 12 – 12 1/2 hours a night. could that be too long and messing her up? Please help. Natalie, you can drop it in any order you want to. The benefits of dropping the 10:30 feeding first are:1-longer nighttime sleep for you2-reaching that longer sleep for her, which helps in brain development.But, she shouldn’t have more than 9-10 hour of sleep if breastfed at this age. The dreamfeed is typically dropped between weeks 9-15, so she is in that range.You can drop 7:30 if you prefer and see how it goes. Just then expect her to take a bit longer before she is ready to drop the dreamfeed. Also, if she doesn’t move bedtime back or feedings back for a while, since her last feed is currently 5, once she does drop the DF, you can’t expect her to sleep past 5 or 6 AM. There is a good chance she will extend some of those 2.5 hour intervals so it all moves back by then, but just in case, be aware. Lorri, Thanks! I love it. I would try the tylenol. 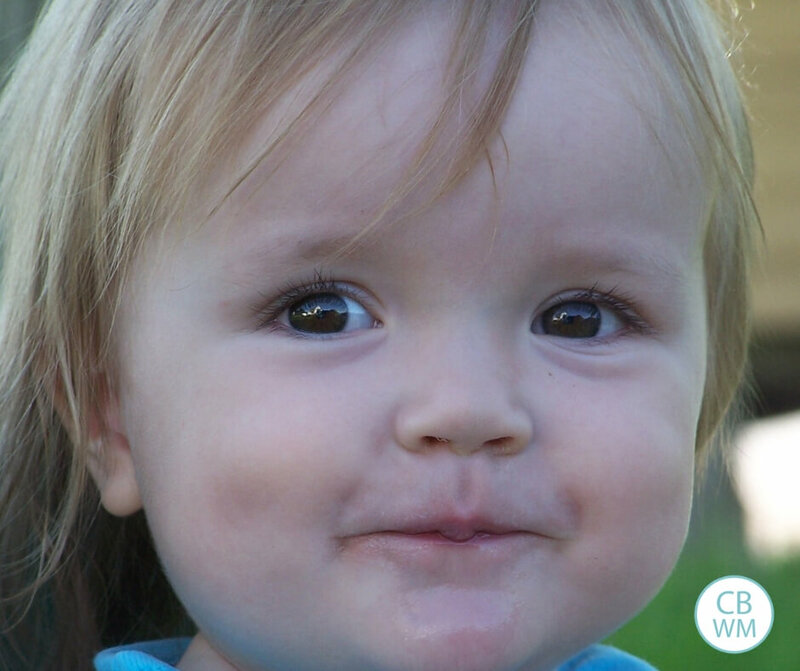 Kaitlyn didn’t start teething until she was about a year, and hasn’t ever had napping issues until these molars, but you can see what a difference the pain killer made for her. My guess is it is a teething problem. Jennifer, I know, I am very much looking forward to the video monitor. My husband has big plans that are far more complicated than a simple video monitor. My mom raises horses and has a video monitoring system so she can watch them closely during foaling season. She can access the monitoring from any TV and computer in her house. I think my husband is thinking big like that…lol. Cute pic btw! And congrats on the baby.So I just can’t decide what to do. I feel as though I should maintain that feeding because she has a very difficult time remaining awake for more than an hour at a time (meaning that if she wakes for an hr and is ready to go down I can’t always get her to sleep for longer than 1.5hrs so it’s hard to move her to a 3 hr schedule) When she begins to consolidates her sleep more it might be easier. I absolutely can’t seem to get her to sleep later than 6pm. I leave this Friday for the west coast and I’ll see if in the change of things I can manage to move her bedtime to 7 pm instead of 6 pm. Even 6:30 would be good. Thanks for your help and I’ll let you know how it goes. Celeste,That is good news!Our schedule isn’t actually a lot different, it is just easier to get the things in I had scheduled. I think that is one reason I really like one nap a day.Does she have independent playtime? If not work that in. I would check the blog lable “waketime activities” for ideas. Also, I have a post planned for how to do more than make it through the day. If you haven’t read toddlerwise, now would be a good time. I know Rachel! Hurray! And oh yeah, newborn schedule. Ugh. ;)Do you mean drop the afternoon nap so your one nap is in the morning rather than the afternoon? If so, you don’t do that. You don’t drop the afternoon nap until your child is closer to 4 (some older, some younger) and you transition to rest time.If your child is needing less nap time in the day, decrease the morning nap more. If it starts pushing the afternoon back too much, just wake earlier. Sorry if that makes no sense. Let me know if I totally missed your question. Megan, I know, I need it. It would have been much easier with this situation since Kaitlyn can be so quiet! Thank you so much for sharing in the joy of Isabella finally going down to one nap. It is nice that is falling asleep right away and taking a good long nap. Ideally I would of loved for her to be able to make it till 1:00 pm, however it was taking her an hour and a half or two hours to fall asleep at night and I felt something had to be done. I am slowing pushing her awake time, she made it till 12:00 today and she has a early bed time. For the first time last night she slept 12 hours from 7:00 to 7:00. Whereas before she was waking between 6 and 7.There have been some difficulties for me in the transition. I will be looking forward to your post on not just making it through the day. That describes how I have been feeling this past week. Yes, she does have independent play time and she does real well with it. Normally it is for 45 minutes to an hour after breakfast in her playpen. My struggle has been keeping her busy after 10am till lunch time. Also when she wake from her nap I have been working on blanket time is it ok for her to have independent playtime again in her playpen in the afternoons? Being that she has been going down at 12 for her nap she is waking at 2:00/2:30 and it has made it for a long afternoon for me. I have read up to conflict, training and correction in toddlerwise. This past week I have been referring back to structuring your child’s day alot. I will check out the blog label you suggested. I hope all is going well with your pregnancy. I have been praying for you. Also, I like the idea that someone suggested awhile back about you figuring out how to make a little money with the work you do on this blog. You put in a lot of time and effort and have been such a blessing to many mom’s trying to figure out how to be a good mom. How long do you find it takes the child to get adjusted to taking a longer afternoon nap, once the morning one has been dropped? I have a 16mo who has shown all the signs of readiness to drop the morning nap, but after a couple days of doing that, he’s still only sleeping about 1.5 hours, from 12-130. (He used to take two 1.5 hour naps.) Should I stick with it for a full week or two before I make any adjustments? Any ideas? Thanks! Traveling Turtle, a 1.5 hour nap is an acceptable length. I wouldn’t stress about it. Kaitlyn also took the third nap some days until she was 11 months old. I know most drop it at 8 months, but not all.When Brayden was that age, his naps weren’t ever longer than 2 hours. Any nap at least 1.5 hours in length I would call a success. Thanks Natalie! And good luck in figuring it out. I look forward to hearing how it goes. Thanks for sharing your ideas Christie! Kelly,My guess is the average is a week or two. I would give it a week then revaluate (which it has been a week by now). If naps are still short after a week, my guess is he isn’t quite ready to make the full adjustment to one nap and might need two some days, one others, or two every day with one being short (the morning one). Hi Valorie – I have a question about naps. Brady has always had some problems with naps, but now he will rarely sleep past 1 hour for both naps. He is almost 12 months – will be in 2 weeks. His normal nap times are from 9:30 – 11:30 and 1:30 – 3:30. On a very rare occasion he will go past the hour mark. But lately, as soon as the hour mark comes – he starts to wake and will not go back to sleep. So – I’m wondering if he is ready to drop the morning nap? Or I’m wondering if I should extend his wake time and see what happens. He’s still sleeping 12 hours at night with no problems.The only thing is that we just had a new nanny start – last week. So I’m very hesistant to start something else new right now. But – I have no idea what’s going on with him and why he won’t sleep past an hour. Do you think an hour each nap is enough; or should I try extending wake time or dropping the morning nap? Also, when you drop the morning nap how does your schedule change? I really don’t think he’s ready to take only 1 nap a day, but who knows. Thanks so much for all of your help!! Please, anyone feel free to post in response to this.I believe that my almost 13 month old could be ready to give up her morning nap. Here is the situation…for the past few days she has been waking, primarily from her morning nap, SCREAMING, after only being down for a few mintues, she has been doing in this in the car as well. I am not sure if she is having bad dreams, teething pain or if she isn’t tired but still trying to sleep and getting frustrated. Last night she woke twice in the night crying, very strange for her, but could put herself back to sleep. Something else that is strange is that she has been wanting to lay down extremely early for her morning nap. I am not sure why that would indicate needing to drop the nap other than she needs more sleep at night. She generally sleeps from 8:30 p.m. – 7:00 a.m., give or take 15-30 minutes for each.Any suggestions? 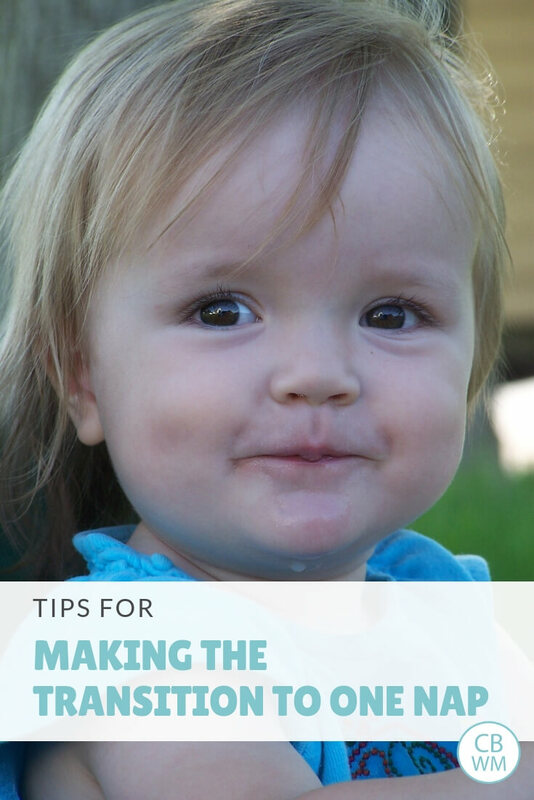 What did your child do when they dropped the morning nap?She is teething right now, both molars and incissors are swollen and breaking through the gums.Thank you! Jessica,I would honestly attribute that to the molars and not the morning nap needing to be dropped. Since she is waking in the night, that says to me something is bothering her. Molars and incissors are aweful–to get them at the same time is probably torture for her! I would first treat for teething and see what happens. Is it possible that my 12.5 month old is ready to drop the morning nap? For the past two days he’s slept normally (2 hours and I wake him) for his morning nap and woken up after an hour or less from his afternoon nap. He will play until I come get him. His night time sleep is normal with the exception of him getting up about 30 minutes prior to wake time when I used to have to wake him myself. Thanks in advance for your thoughts! LEMI’d have to say that he is ready to shorten the morning nap not drop it. Try shortening it to 1.5 hours and see how the afternoon nap does. Eventually, you may need to shorten it to 30-45 minutes before completely dropping it. It is pretty common to have the afternoon nap suffer when the morning nap needs to be dropped, or in your case, shortened. Well before I got your response my now 13.5 month old stopped doing what I said previously and he began waking early from both naps and also in the AM. He also seems so much more cranky than usual which makes me think he sleep time is not adjusted correctly. Lately he has been taking about 15-30 minutes to fall asleep. Sometimes waking early, sometimes not. I feel there is no real pattern. I tried shortening the AM nap, but nothing has changed. Here's what happened today:7:00 woke up but was awake before I came in9:30-11 nap (took 15 min to fall asleep and I woke him at 11 in attempts to shorten this nap)2-4 nap (took about 35 minutes to fall asleep and it's only 2:40 right now so I don't know when he will wake. My guess is early probably around 3:30)7:30pm is his bedtime but he typically takes another 30 minutes to fall asleep here.What would you do if you were me? LEM,It is possible that what happened is he has developed a lack of sleep over time. A lot of times you can change something in the routine (shortening morning nap) and not see the negative effect until several weeks later after the deficit has built up.He should be getting the same amount of sleep each day. So if you shorten a nap, the other should lengthen and/or bedtime should come sooner. Him waking early in the morning is a sign that he was overly tired going to bed (or it is possible it is the sun).It is common for the one year old to have some off days for naps.I think I would try keeping naps the same length, but extending waketime between the naps a bit. Also, if your naps used to be from 9:30-11:30 and then from 2-4 but you are waking him at 11 to shorten the nap, I would move afternoon nap up to 1:30.When I am at the point of shortening the morning nap to preserve the afternoon nap, I like to shorten it by adding time before the morning nap rather than waking early. Okay, cliff's notes version of what I would do:1-go back to old schedule for a few days and see how that goes.2-if after a week or so naps are still off, I would lengthen the time before the morning nap in 5-10 minute increments. See how that affects the afternoon nap. Keep afternoon nap at the same time.3-If the afternoon nap doesn't lengthen out, you might need to have bedtime earlier.Try that and go from there. Just wanted to update on what's been happening. After trying many different things I was able to figure out his naps. My 14.5 month old now naps from 9:30-10:30 (I wake him) and then from 1:30-4 ( I wake him about 50% of the time). He falls asleep within minutes and is doing great.For bedtime though it takes him nearly 1 hour to fall asleep! And sometimes ends up waking earlier than my desired waketime. I usually put him down at 7:30. I tried putting him down 1/2 hour later at 8pm and still took him the same amount of time to fall asleep. Should I out him down even later like 8:30? That seems so late for me. I am wondering if he is just sleeping too much during the day now. LEM, Bedtime is counterintuitive. Try an earlier bedtime. When they wake early in the morning, it is usually due to a too late bedtime. Try 7 PM. I am glad things are improving! I need some help! My 14 month old has been napping so well for months now, like two almost 2 hour naps a day! I have been in heaven. Lately thought he has been all over the place! Some days his morning nap will be a good 2 hours but then his afternoon nap is maybe 1 hour. Sometime his morning nap will only be an hour and a half and then his afternoon nap is over 2 hours. I haven't really tried to fix things, I figured it could just be a phase and maybe he will just start napping well again, but that isn't working! My final conclusion is maybe he is ready to drop his morning nap? Could that be a possibility? He is just barely 14 months, I thought they were usually supposed to be 18 months. When we are at church on Sundays he does miss the nap and does okay and then usually takes a good afternoon nap. Sorry I have been rambling but any advice would be great! Brynn, I would first try just shortening the morning nap–limit it. That way days can be more predictable. It is possible that he is ready for just one nap, but he is on the young side. See the blog post "dropping the morning nap: transition time." We went through something similar at 14 months with Kaitlyn, and my conclusions are in that post. Having sleep nap issues with my 18 1/2 month old. 🙁 We switched to one nap at little into 17 months and he took to it great. Was sleeping 3-3.5 hours. For some reason now everything is messed up. He's waking early, anywhere from 5:30-6:30 when his waketime was 7 or 7:30 (sometimes I even used to wake him up because I don't like him sleeping past 8) and he's been so cranky in the morning. I put him down around 12:45 like normal and he's been waking up from his naps in only 2 hours or 2 1/2 and I can tell the lack of sleep overall is getting to him. Today on our way home from playdate he actually fell alseep in the car and that hasn't happened since he was 3 months! I was even able to transport him to his crib without waking him. I only let him sleep for a 1/2 hour though because I wanted to make sure he would nap later or I would have a very cranky boy.His schedule was:7-7:30 wake7:45 breakfast10:00 snack11:45 lunch12:45 nap till usually 4 or 4:155:45-dinner7:00 snack7:30 bedtime routine, usually asleep by 8.His dr says its due to the time change and he'll work it out, but we adjusted to that I thought the week before and week after using time increments. The only thing I can think of is that he was recently sick (a cold) and even though he slept bad for the first few days being sick, he was fine after that. He still has a trace cough only during nap/sleep that even the humidifier/vicks doesn't help so maybe its just an overall lack of sleep that caught up to him do to coughing??? Any thoughts?Thank you!!!!! Destina23,I have a few things for you to look into.1-is he cold? The time he is waking is usually the coldest point in the night. If so, you might dress him more warmly for bed or put a small space eater (with a thermostat) in his room.2-The degree of sleepiness sounds like a sickness to me. Even if my kids get up early, they don't fall asleep in the car unless they are sick. I know you said yo spoke to your doctor, but since I think that I thought I had better put it out there.3-He could be getting teeth. This is about the age for the…what are they called…pointy teeth? This is the age those usually come through.4-Finally, it could always just be a phase. But I would look into other reasons before attributing it to a phase. Most people say 68-70 degrees is a good sleeping temperature. I do 70 degrees with warm PJs and socks if the PJs are no footed. Good luck with it all! Hi! My son is 16 months old and has had his morning nap dropped for about 1 month or so. He has done awesome with it but his naps are still not getting any longer. They are usually around 2 hours, sometimes a little shorter sometimes longer. When we were figuring out if he was ready, we tried shortening the morning nap and doing that whole process, but he just didn't have it. So, we just dropped the nap cold turkey eventually after trying everything that I could find to try on here, in books, etc. He wakes in the morning between 7/7:30 and has been going down for his nap just before 12. I then always leave him until at least 2 or whenever he wakes. Bedtime has been between 7/7:30 depending on his nap. He is sleeping great at night still. He is not a bit cranky with this short of a nap, but I know he would be better off with more sleep.So..I have two questions…1. Why is he not taking a longer nap? How long does it usually take for them to extend this nap longer? Any thoughts on why he isn't taking a longer one if it shouldn't take this long?2. How do I know if naptime is right? I've been sticking to the same time for a few weeks now but he just isn't consistent or taking a longer nap yet. How do I know when he is ready to stay up longer until 12:30 or 1? What kind of intervals do you suggest for stretching him to a later time? Is this usually after a few weeks you can push it back a bit or is it after a few months? Just trying to get a feel for what this part of the transition has looked like for other moms 🙂 Thanks so much!!! Kristin,1–he probably isn't fully ready for the one nap, but can't really do two, either. As he gets older, he should extend.2–you would most likely just need to try it out. I would probably do it in 15 minute increments and wait a couple of days between moving again if you need to. He most likely shouldn't go any later than 1 PM with a 7/7:30 start time.